The Pacific Forum leaders summit has concluded without unity on climate change. While leaders have talked of solidarity, cracks have appeared over the subject of climate change. Calls for the region’s metropolitan powers to adopt more significant measures to tackle climate change have taken on added urgency in a year where the islands have experienced climate chaos on a number of fronts. Flooding caused by huge spring tides in parts of Micronesia in late summer was blamed by local officials on climate change – as were unseasonal storms still affecting parts of the region. And now, several countries in the Pacific are struggling with the worst drought in decades as this year’s El Niño weather pattern takes full grip. In Papua New Guinea’s Highlands alone, dozens of deaths in recent weeks have been linked to food shortages caused by the prolonged drought and severe frosts. And, just to underline the climate disorder in the Pacific, freak hailstorms killed 11 people in Indonesia’s tropical Papua province in July. New Zealand’s Prime Minister John Key said he was comfortable with his country’s stance and position on climate change. Both New Zealand and Australia have made no commitments to reduce emissions further so that global temperatures didn’t increase more than 1.5 degrees above pre-industrial levels. It’s not the best outcome that we would have liked but I think we must respect that whether we accept that or not is a different question but at this point and time we would like to be able to sit down as colleagues and agree on the range of numbers rather than one or the other and I think this is the way we have come out of this meeting,” he said. His counterpart from Palau, Tommy Remengesau, echoed his sentiments, saying the time for talk had ended and that urgent action was needed – which would require greater unity. “This is the challenge facing regionalism – what can we do that brings out the most good for everybody, especially when it comes to matters of life and death and survival, sustainability? 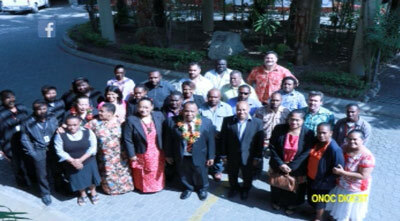 “Those issues are the very reason why there is a Pacific Islands Forum. If you don’t believe in those then there really should be no solid effort here,” he said. “All the Pacific islands are always frustrated because you are not talking about small changes,” he said. Niue Premier Toke Talagi said that while there were differences in the various countries’ positions, they were understandable. “Every country has the right to express their view about climate change. We must accept and respect the fact that each country will have their own differing circumstances in relation to economies and so on,” he said. 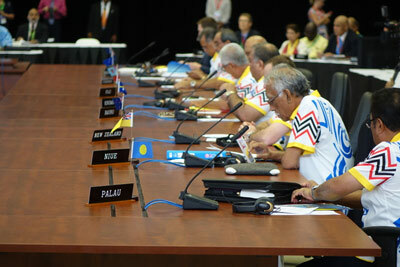 Samoa’s Tuilaepa said, despite differences, he did not expect animosity to develop between the various nations. New Zealand Prime Minister John Key suggested Pacific nations needed to put more pressure on even bigger nations like China as his country was only responsible for 0.15% of the world’s emissons. His Australian Prime Minister Tony Abbott agreed. “Australia and New Zealand have already announced very ambitious targets for emissions reduction to take to the Paris conference,” said Abbott. Regarding the other big agenda issue, human rights abuses in the Indonesian region of Papua, or West Papua, Pacific Island leaders urged the Forum Chair and PNG prime minister Peter O’Neill to approach Jakarta about their concerns and discuss their openness towards a fact-finding mission. “On West Papua we note that we respect the sovereignty of Indonesia over West Papua, and we note some of the concerns that we have about the human rights concerns situations in the Papuan provinces. PFF said it was yet another “diplomatic insult” to the Fourth Estate and needed urgent attention. “Members of the Pacific Islands Forum are notorious for hosting events that detain, sideline and obstruct news media from doing their jobs,” said PFF chair Titi Gabi. West Papua campaigner Benny Wenda was refused a visa and not allowed entry, despite earlier promises from Prime Minister O’Neill. “This is a direct denial of freedom of access, movement, and speech on an issue that is the region’s most urgent human rights concern,” said Gabi. “We commend his decision to stage an inquiry into this incident and call on him to raise this issue with his regional counterparts,” PFF said. “Their treatment compares with colleagues from New Zealand and Australia who, as members of official parties to PNG, enjoy visa-free entry,” says Gabi. 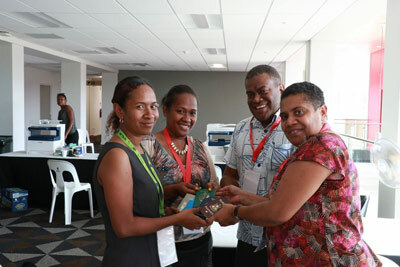 Treatment of the journalists in PNG raised deeper concerns for those coming from countries under the Melanesian Spearhead Group, which claims to allow visa free travel between members.PFF Co-Chair Monica Miller said that Pacific journalists have also long raised the point that Australia and New Zealand also charge steep fees, for even transit visas. “Oceania states cannot hope to benefit from regionalism if they keep denying media access to borders and sources,” she said. “Oceania governments need to encourage Pacific news media to take greater interest in regional affairs, not punish them,” said Miller.